Though we don't have much in the way of seasons here in California, we do get a little bit of rain sometimes, so I planned our U is for Umbrella preschool theme for a rainy week. We were in luck--it rained two of the days during our umbrella unit, so we were able to connect a rain theme to our umbrella unit. However, you could easily do an umbrella theme without rain--as umbrellas are often used to shade from the sun as well. We talked a little bit about both uses of umbrellas, but we focused more on using umbrellas in the rain. In addition to our usual letter of the week activities--practicing tracing and writing the letter, going on letter hunts for words that start with the letter, and reinforcing the sound of the letter through all of our activities, we also added another challenge. My oldest is starting to put sounds together more and more, so I decided to challenge him with this file folder game that has several blends. I still had to help him a lot with this, but it was good practice sorting the pictures by starting sounds. You could easily make a simpler version, sorting pictures with easier starting sounds. 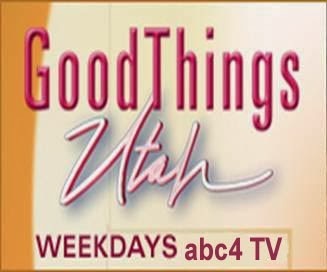 The link includes blank templates. This book is basically a jungle version of the Mitten. I felt that the writing was a bit awkward at times, but nevertheless my kids loved it. Jan Brett's illustrations are always detailed, beautiful, and interesting. My boys loved all of the jungle animals. This cute little book features a pig and her umbrella. She gets into a lot of trouble because wants to take her umbrella everywhere… My kids really enjoyed watching her problem-solving. I also made a printable of two umbrella/rain-themed poems, and I shared these with my kids. 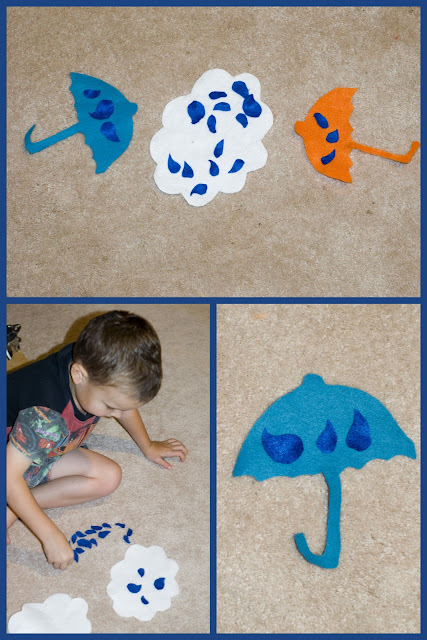 We did my own variation of the raindrop counting mats that I found on this website. I clapped my hands a certain number of times (like "thunder"). The kids had to listen and count how many times I clapped, and then they had to choose the corresponding number of "raindrops" from a white felt cloud mat and put them on their felt umbrellas. For example, I might clap three times, and then they would each put three raindrops on their umbrella. 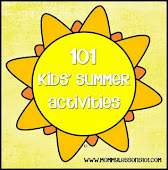 You could make this as simple or challenging as you would like depending on your child's skill level. I just freehand cut out the felt pieces for the game. The kids really enjoyed this, and we even got their dad to play the game with us one evening. If you want to be more competitive, make it a race to see who can get the right number of raindrops on the umbrella first. I also let my kids take turns clapping while I played the game. This website has some great rain-related science activities. I showed my kids some YouTube videos about the water cycle. Then, we demonstrated the water cycle using a pot of boiling water. I boiled the water with the lid on and I showed the boys how the water condensed on the lid. Then, I showed them how the water could slide off the lid and "rain." I also made rain with a sponge. We added drops of water to a small sponge until it could hold no more--just as a cloud fills up with water. Then, I squeezed the sponge and showed them how it "rains" when the cloud is full. We also poked small holes in disposable Styrofoam bowls, then we filled the bowls with water and watched the "rain" pour through the holes. I showed my children A Sunday Afternoon on the Island of La Grande Jatte painted by Seurat. I taught them about Pointillism, having them note how the picture was actually made of many tiny dots instead of long brush strokes. Then, I had my kids try to make their own simple dot pictures. 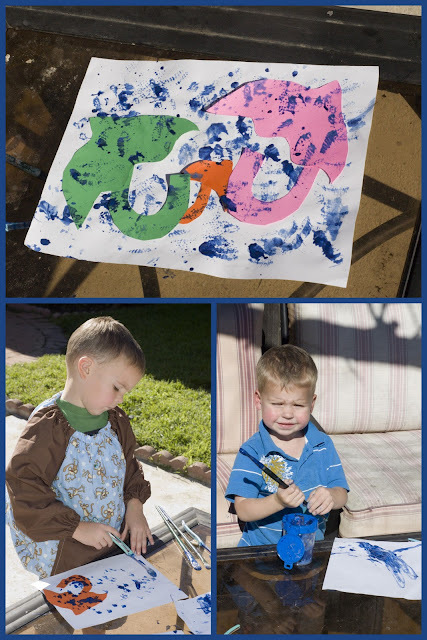 We just used regular markers, but these do-a-dot paints would be fun for a toddler version of this artistic style. My kids have used these at library arts and craft time and they love them. My kids quickly realized that it is a lot of hard work to make a picture just out of dots--so they didn't get very far with their own pictures, but they did learn something. We also had fun looking through these pictures of modern art installations with umbrella themes. If you plan your umbrella-themed lesson during a rainy week, put on your rain gear, go out, and enjoy splashing in the puddles! Or, if it's sunny, you could take a beach umbrella and head to the beach or park. We were in luck--during our U is for Umbrella week we had some rainy days and some sunny days. When it rained, I turned on the song "Singing in the Rain" while we splashed around our back patio. 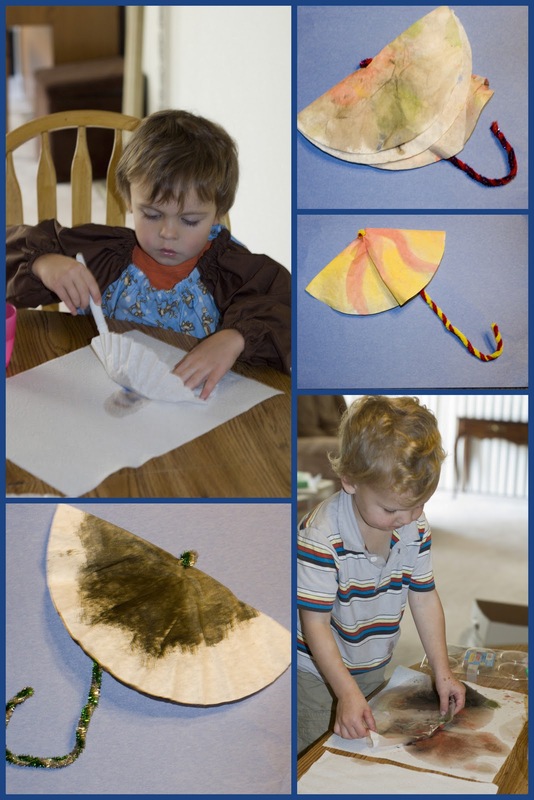 We painted coffee filter umbrellas. I got a pack of hundreds of coffee filters at the dollar store--these are great for crafts. Another day, we tried to do this umbrella activity in which you flick blue paint onto the paper with a toothbrush. I quickly realized that this was not the right sort of activity for my boys--they are just too boisterous and enthusiastic, and paint was spraying everywhere. So we altered the craft a little bit and instead of flicking the paint onto the paper, we just dabbed it on with the toothbrush. They still laughed and had fun painting with an unconventional paintbrush. 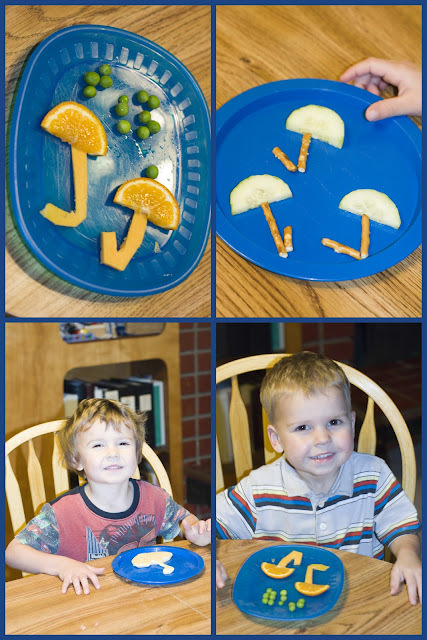 We had a lot of fun with our umbrella-themed snacks. Almost anything could be turned into an umbrella--just cut the food in a semi-circle shape and add a skinny "handle." During our umbrella unit, we had umbrella-shaped pancakes for breakfast one day, umbrella cucumbers with pretzel-stick handles for a snack, umbrella orange slices with cheese handles and green pea "raindrops," for dinner, and umbrella-shaped sugar cookies for dessert. There are a lot of classic "rain" songs you could sing when talking about umbrellas, such as "It's Raining, It's Pouring," or the "The Itsy Bitsy Spider." My kids' favorite is "If All the Raindrops were Lemon Drops and Gumdrops." This website also has some additional umbrella-themed songs and activities. I also love making sounds of "rainstorm" with a group: snapping, rubbing hands together, stomping feet, etc. I tried to see if I could do our own miniature rainstorm sounds with just the three of us, and it actually worked. I snapped my fingers, while my two sons rubbed their hands together and stomped on the ground. They were delighted with our little rainstorm sounds. For more "U is for Umbrella" ideas, see my board on Pinterest!